A class of robust smoother and interpolator algorithms is introduced. The motivation for these smoothers and interpolators is a theorem concerning approximate conditional-mean smoothers for vector Markov processes in additive non-Gaussian noise. This theorem is the smoothing analog of Masreliez’s approximate non-Gaussian filter theorem (IEEE-Auto. Control, AC-20, 1975). The theorem presented here relies on the assumption that a certain conditional density is Gaussian, just as does Masreliez’s result. This assumption will rarely, if ever, be satisfied exactly. Thus a continuity theorem is also presented which lends support to the intuitive notion that the conditional density in question will be nearly Gaussian in a strong sense when the additive noise is nearly Gaussian in a comparatively weak sense. Approaches for implementing the robust smoothers and interpolators is discussed and an application to a real data set is presented. 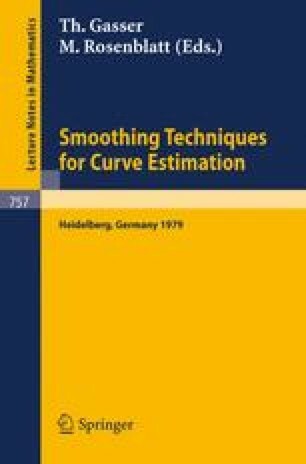 Invited talk delivered at the Heidelberg Workshop on Smoothing Techniques for Curve Estimation, Heidelberg, Germany, April 2–4, 1979. This research was supported in part by NSF Grant ENG 76-00504.